Kromer - About Us - Helping You Maintain the Dream! Helping you maintain the dream! The Kromer Company was founded by O. W. Kromer in 1945 as an agricultural equipment company. Even in those early days, Kromer was committed to manufacturing the best quality equipment at a fair price. During the last 20+ years Kromer Company has been dedicated to using its engineering experience to produce the best Athletic Field Maintenance products. Ease of use, superior quality and durability are our top priorities. We take pride in our achievements, but continuously challenge ourselves to excel in every aspect of our business. We want your Kromer experience to be rewarding and satisfying. At Kromer, we understand the Athletic Field Maintenance business. Our goal is to build equipment that will assist groundskeepers to efficiently and effectively improve and maintain their athletic fields. Whether you need to chalk and groom a baseball field, paint or remove lines and logos, change a baseball field to a football field in just a few hours, groom & disinfect a synthetic field, Kromer has a solution. You can line and mark soccer, lacrosse, rugby, track & field, even cross-country events with Kromer equipment. From little leagues to professional sports teams, from high schools to universities, from local to federal government, Kromer has an Athletic Field Machine that will fit your needs and budget. You can save time, labor, and materials with Kromer's 50+ customized options & attachments to make your fields look and play great. 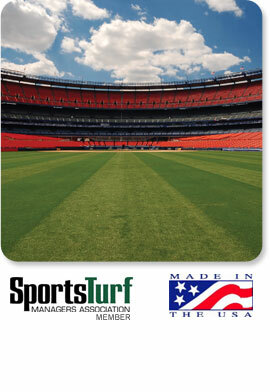 Whether you are a sports turf manager, groundskeeper, field supervisor, athletic director, coach or a volunteer, we applaud you for your efforts to have a well-maintained, safe and level playing field. A field where lasting memories occur, balls bounce right, and dreams come true. Kromer understands your needs! What do great athletes, winning teams, happy coaches and enthusiastic fans all have in common? A KROMER GROOMED FIELD. Our Field is Preparing your Field.